by Kristen Harrison, Publisher of the Principia Space Diary. Photo credit: Sarah Winborn. For those interested in pedagogical methodologies, here’s a whistlestop tour of ours. This article is an overview of the methods and principles that guide our work at The Curved House, and some of the background thinking that has gone into the Principia Space Diary programme. It includes research that has informed and inspired us, that I hope you will find useful too. At The Curved House, where the Space Diary is published, our motto is “Create to Learn, Learn to Create”. We apply this to everything we do and we believe that integrating the arts and creative practice into education can build bridges to even the most complex subjects. This is the starting point for how we have approached the Space Diary programme. We wanted to build big, beautiful, safe bridges to STEM and literacy learning that would make primary school kids really excited about exploring new territories. New things can sometimes feel alien or intimidating (even to us adults) but research tells us that a creative, multi-disciplinary approach can make new things feel relevant and empowering. Our 10 principles are based on both experience and research. In terms of experience, a background in book publishing and production has taught us that the framework for any creative process (for example, making a book) can be a hugely effective way of framing teaching, and an even more effective way to empower learners. Creating a book requires several modes of thinking, from brainstorming and imagination, to researching and developing ideas in long form, communicating in short form, designing, collaborating and physically making. These are active ways to learn with a physical outcome (a book) that is the ultimate reward. In terms of research, we have been inspired by visual literacy, and the discourse around it, for many years. We frequently draw upon work coming out of the International Visual Literacy Association (on whose board I sit), the Toledo Museum of Art (who are doing excellent work at the cross-section of museum education and mainstream education), Visual Thinking Strategies (who teach people how to teach visual literacy) and artists like Deborah Curtiss who help us see how to see… so to speak. Also a research inspiration, Gardner’s Theory of Multiple Intelligences is a shining beacon of amazingness that we frequently consult. It is a simple, logical theory that debunks the idea that intelligence is one thing. If you haven’t read about it already, start now. It is particularly useful if you are having trouble engaging certain students as it presents ideas for changing the approach to appeal to their natural intelligence/s. While The Curved House are interested in creative and visual education, the Space Diary is one of several Principia Education Programmes whose aim is to engage students in STEM learning. It was therefore a priority to seek out new research specifically dealing with STEM and STEAM education (the “A” being for integrating Arts into STEM learning) and look at how that could be incorporated into our existing methods. We have found two institutions in the UK doing particularly exciting work in these areas, and whose work is accessible for organisations like us who like to put things into practice. These are Kings College London and Cambridge University’s Education Department. Professor Louise Archer and her team at Kings College London have developed a concept called Science Capital to help us understand how we can encourage an interest in science and STEM. KCL researchers say that in order to increase the number of people going into science-related careers, we need to help children develop what they call “Science Capital”. That is, a broad understanding and appreciation of science, as well as specific knowledge. This can happen through exposure to science in various different contexts, including participation in science at school, knowing a scientist in your family and friend network, visiting museums and galleries and science media. While the research around Science Capital is primarily concerned with getting more people into STEM careers, it also has wider applications that can help everyone – regardless of the career they choose. On the one hand, there are global concerns like food production, climate change and population problems that effect all of us in our daily lives and having a degree of Science Capital can help to understand these issues, and make better choices. On the other hand, being able to think like a scientist is a skill that can help in many personal and professional situations. It involves hypothesising, problem-solving, inventing, creativity and collaboration. I challenge anyone to name a single career that would not benefit from these skills. As the Space Diary has evolved we have incorporated more and more ideas that link back to Science Capital. Things like incorporating collections and resources from museums, to creating activities that need to be done at home and in collaboration with family and friends (e.g. Making History), to including interviews with real scientists and people in other STEM-related careers. The second significant research influence comes from Professor Pamela Burnard and colleagues in Cambridge University’s Education department. Their work explores the integration of arts and creative practice into education and is a hotbed for innovative ideas and thinking. Just recently they advertised for a Professor of Play in partnership with LEGO which has to be the ultimate dream job! One of the things that appeals to us about the Cambridge research is that much of it is focussed on educating children within the world they live in, rather than trying to impose a version of the world that we adults understand (or think we understand). To go back to the bridge-building analogy, the work being done here seems to be very much about building bridges between how we educate and how children experience the world. This is of primary concern for us and it is motivating and reassuring to see academic work that takes this issue on. One great example is a recent project that had students live-coding electronic music (see video above) which is an unconventional yet entirely relevant way to teach students music. Why not have students making music they like to listen to, and understand? This programme had really positive results in terms of empowering students and encouraging risk-taking and this has inspired us to think about how we can push our digital offering. We have made small steps with the second edition of the Space Diary, incorporating some augmented reality using Zappar technology and collaborating with Code Club and Raspberry Pi to develop three coding activities, and we are thinking about how we can incorporate music and/or music making into future programmes. I had the opportunity to meet Professor Burnard and she asked a number of good questions that made me reflect on how we had designed the programme. Something that has resonated is the questions of the role children might play in the development of our programmes, not just after the programmes are developed. What ideas might they input into the programme design itself? How might they help us to teach better, and more creatively? 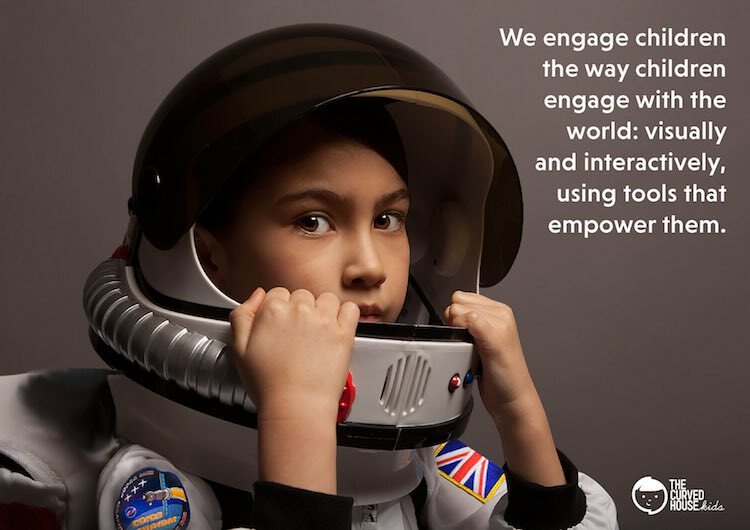 For the new version of the Space Diary, we have taken this on board and asked a group of participating teachers to invite their students to create lesson plans and extension activities that we will publish with the Space Diary for other schools to use. We have also invited students to interview eachother and have their interviews published on the Space Diary blog. Small steps, but important ones, that bring us back to the most important thing: empowering learners. The Principia Space Diary will continue to evolve as students and teachers use it, contribute to it, and inform our improvements. And we will continue to learn as we teach. I’d love to hear from you if you have any ideas or research that can help us to make it even better. Feel free to contact me at kristen@thecurvedhouse.com.